Vienne is about five miles in circumference, including a mountain on which were two strong castles in the time of the Romans, and of which there are still some considerable remains. 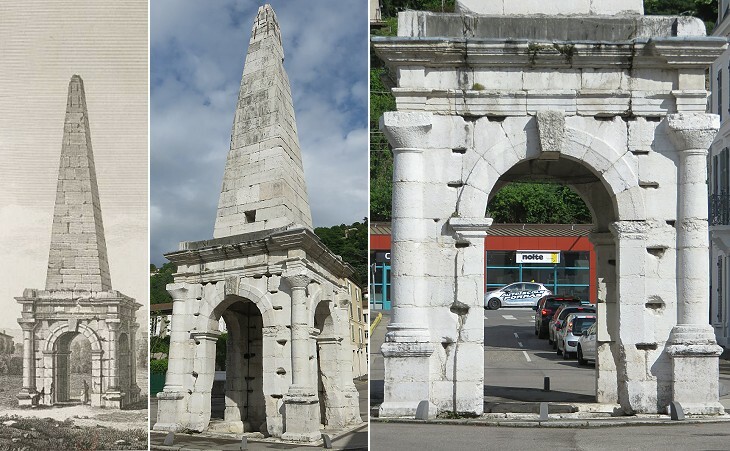 Vienne is still a large town, standing among several hills on the banks of the Rhône, though all its former splendor is eclipsed, its commerce decayed, and most of its antiquities are buried in ruins. 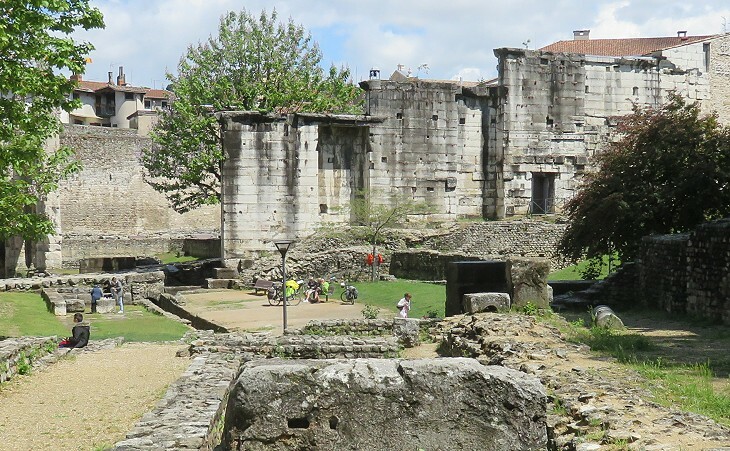 The Castle of Salomon passes with the common people for the prison of Pilate who was banished to Vienne in Gaul according to Eusebius and others after his return from Judaea to Rome. Some ancient historians thought that Allobroge meant coming from abroad and they supposed that the people who lived in the region of Vienne came from Viannos, a town in south-eastern Crete. Today this hypothesis is regarded as a mere fantasy. The Allobroges were subjugated by the Romans in the late IInd century BC. Vienne was one of their settlements which was turned into a Roman colony (Colonia Iulia Augusta Florentia Vienna Allobrogum), by Julius Caesar or by Emperor Augustus. It became the end point of two roads which linked Northern Italy to the Rhône valley across the Alps via the Little St. Bernard Pass. The Roman colony soon became a very prosperous town; its municipal authorities began the construction of a temple dedicated to Goddess Rome and Augustus before the end of the Ist century BC. Temples with this dedication were built at Athens, Ankara, Pola, Ostia and other towns. The temple was brought back to its original aspect in 1852-1870 and archaeologists could study it in its entirety. They found out that the front part of the building was completed in the middle of the Ist century AD and that the name of Livia, third wife of Augustus, was added to the original inscription. She was deified in 42 AD at the initiative of Emperor Claudius, her grandchild, which suggests that the temple was largely restored on that occasion, most likely after a fire had damaged it. Ornatissima ecce colonia valentissimaque Viennensium (Behold that richly decorated and valiant colony of Vienne - Speech of Claudius in the Roman Senate which was carved in bronze tablets found in Lyon). Claudius spoke of Vienne as a beautiful town and actually it retains some finely designed monuments which are proof of it. 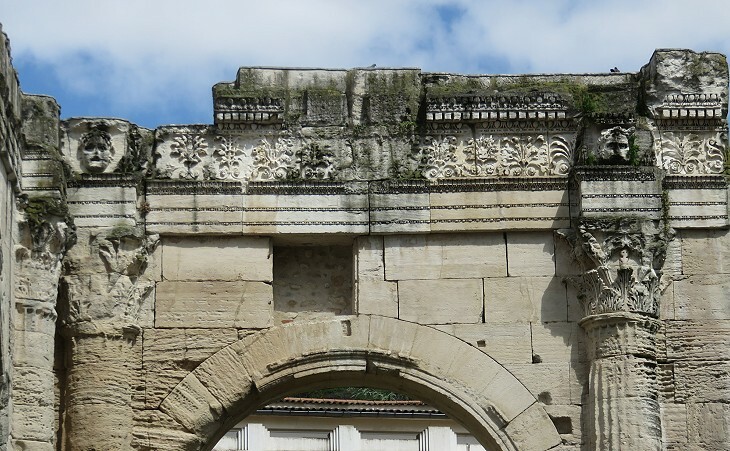 Laborde thought that the portico was part of a theatre, perhaps because of some reliefs depicting masks in its decoration: it was more likely part of the Forum. It is generally dated second half of the Ist century AD. 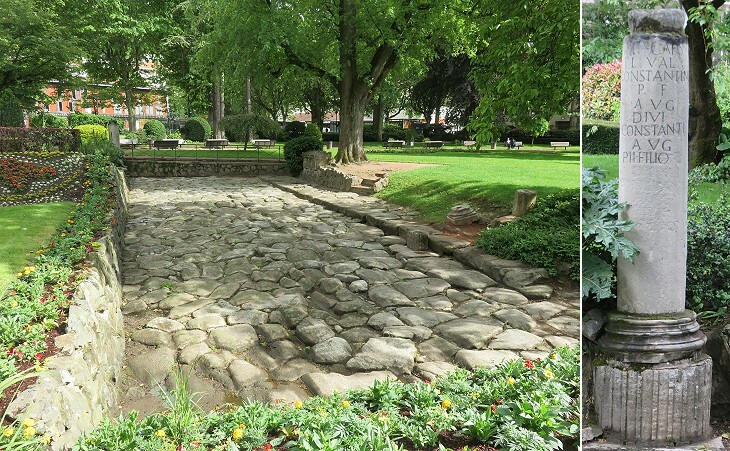 As a proof of its antiquity, there are Still the remains of an amphitheatre, the walls of a palace, and some other Roman buildings. Nugent. The decorative elements of the monuments were carved in a soft and therefore easily workable white limestone which when exposed to air becomes hard. Unfortunately this stone could be calcined to obtain mortar which explains why most of the Roman monuments of Vienne have disappeared. 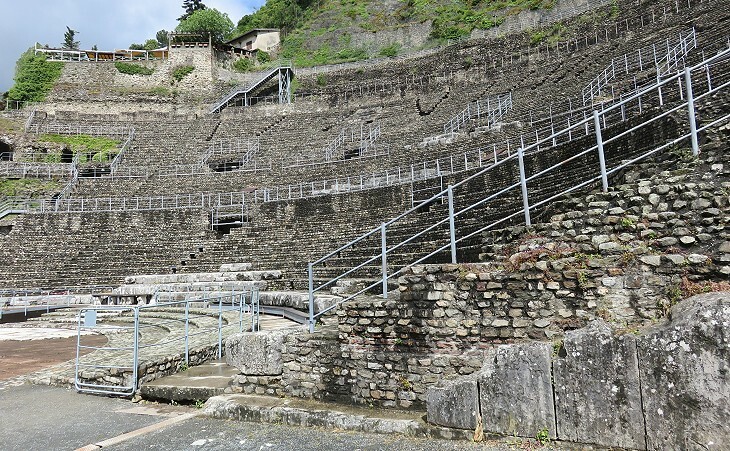 The external diameter of the seating section of the Roman theatre of Vienne was larger than those of Arles and Orange, but the fact that, similar to the theatre of Lyon, it was almost entirely excavated in a hill reduces its interest from an architectural viewpoint. 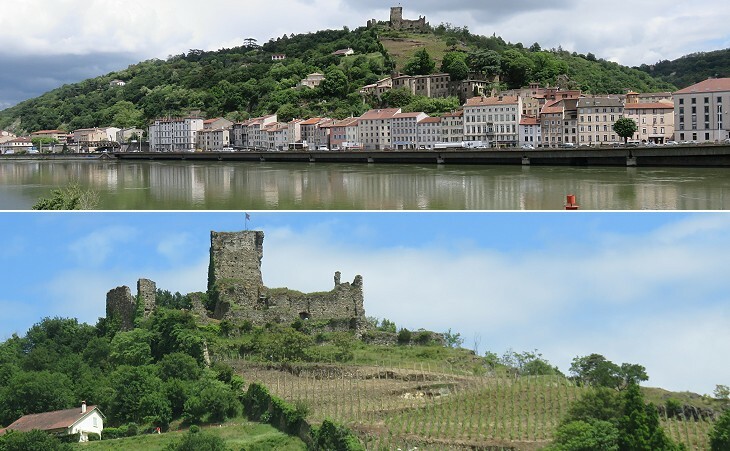 Vienne was renowned in antiquity for its resinated wine and the town was surrounded by vineyards, as it occurs today. The theatre is dated early Ist century AD, but perhaps it was restored/redesigned in the IInd century AD. The scenae frons, the elaborately decorated architectural background of a Roman theatre is almost entirely lost. Most likely it was similar to that at Orange. Les délibérations du corps municipal nous apprennent qu'en 1560 la reine Catherine de Médicis se fit envoyer de Vienne une statue de Silène couché sur la dépouille d un bouc (see a bronze statue at Herculaneum) et un groupe représentant Diane au bain (see a marble group at Caserta). François 1er en avait déjà tiré en 1536 un bas relief destiné à décorer Fontainebleau. Note in the 1828 edition of Nicholas Chorier - Recherches sur les Antiquités de la Ville de Vienne - 1659. Similar to what the Popes did in Rome, e.g. Paul III, the kings and queens of France embellished their palaces with ancient statues (now lost) which were discovered in Vienne. 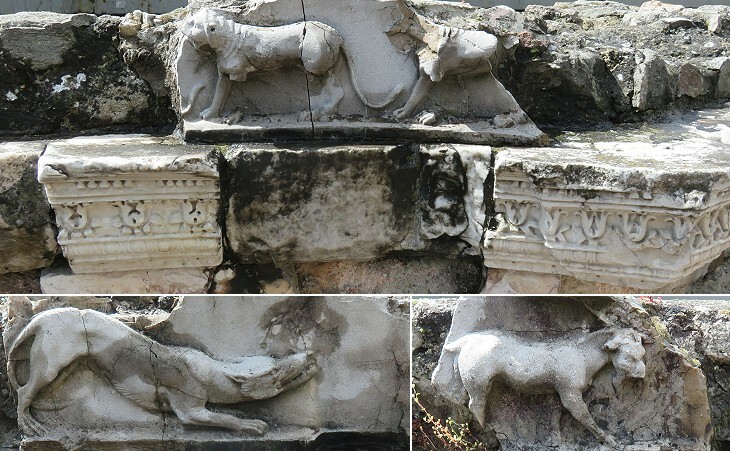 The fragments of reliefs which were found at the theatre of Vienne were finely executed and because they depict animals it is thought that there was a relief of Orpheus charming the animals somewhere on the scenae frons, perhaps in a central position similar to that of the relief of Dionysus at Aspendos. Orpheus was portrayed in some floor mosaics which were found in Vienne. A long ancient wall was unearthed in the XVIIIth century when some buildings between the theatre and the temple were demolished. 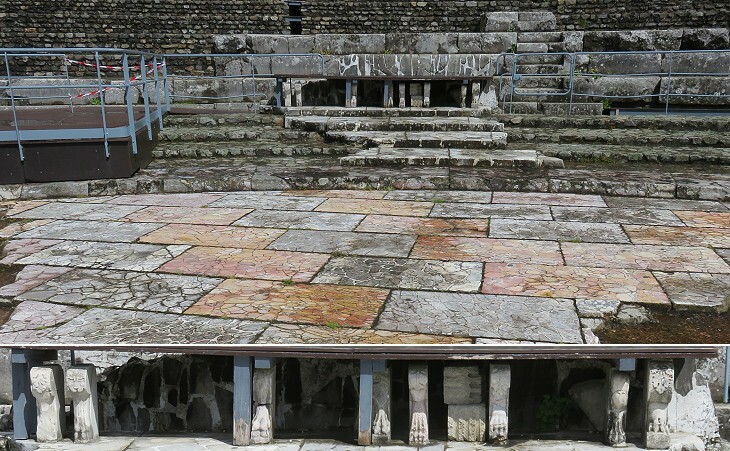 After later excavation campaigns archaeologists came to the conclusion that its purpose was to hide an area where worshippers of Cybele gathered in a small temple and in an adjoining small theatre. The cult was reserved to initiates, similar to that of Mithra. Cybele was an ancestral goddess of the Anatolian tableland. During the Second Punic War a temple to her was built in Rome where she was known as Magna Mater (Great Mother). Her worship gained new impetus in the IInd century AD and it spread to many parts of the Roman Empire, mainly in association with that of Attis, her lover/high priest. This monument puzzled early antiquaries; it was thought to be the tomb of Pontius Pilate, or a cenotaph of Emperor Alexander Severus or a monument celebrating Emperor Augustus. Today it is assumed to have been a decorative element of a late Ist or early IInd century circus which was replaced by another one. As a matter of fact a mosaic at Lyon depicts a pyramid on the spina of a circus. 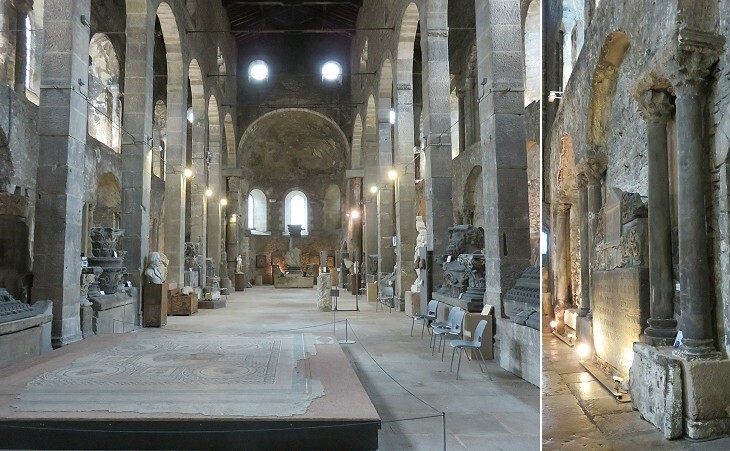 En démolissant ces années dernières le palais archiépiscopal on n a pas été peu surpris de voir le mur méridional assis sur un massif de débris de sculptures antiques amoncelées sans ordre (..) Il semble que ce massif ait été formé dans un moment d'alarme avec les ruines de quelque édifice magnifique pour servir de rempart; ou en a tiré en effet quantité de blocs de marbre, des colonnes cannelées en pierre de choin, des chapiteaux d'un beau style, des morceaux sculptés etc. etc.(..) Quelques uns des objets ont été déposés au Musée (..) mais la majeure partie de ces sculptures ont été employées dans les constructions modernes. 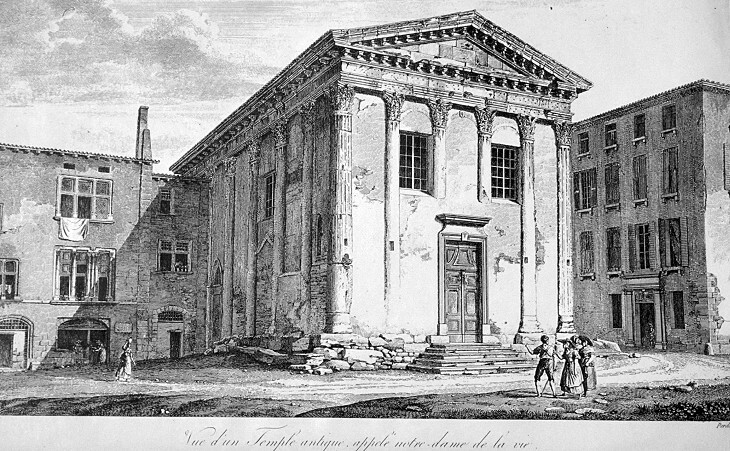 Note in the 1828 edition of Chorier's book, which describes how, when demolishing the palace of the Archbishop, it was found that one of its walls was made up of ancient materials. Most likely the wall had been part of a hastily built defensive bastion. 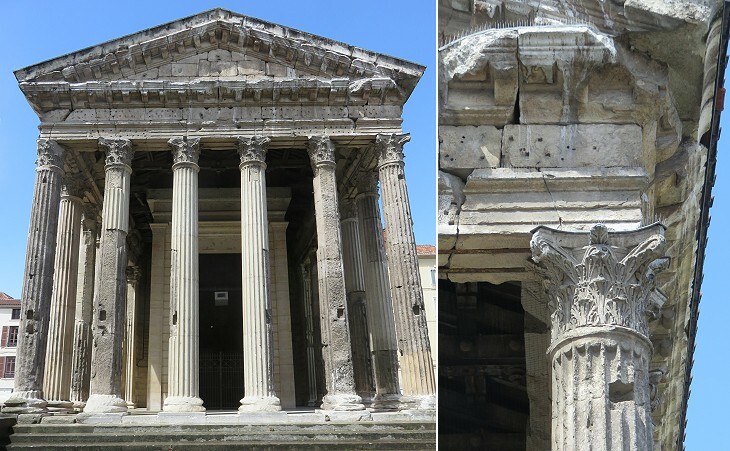 Many blocks of marble, spiral limestone columns, finely sculptured capitals, fragments of statues, etc. were found. Some of them were moved to a museum, but the majority were employed as construction material in new buildings. 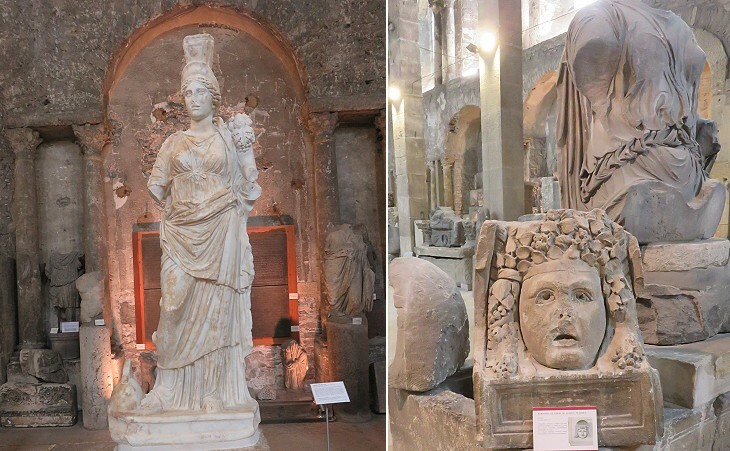 The temple (of Rome, Augustus and Livia) is now a museum and contains a number of sculptured and architectural fragments found in and about the town, a very rich frieze, capitals of columns, etc. Murray. The museum was established in 1809-1822. 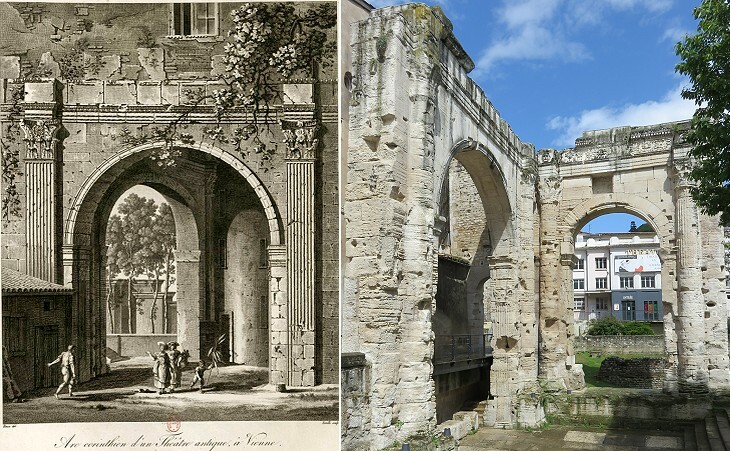 The current display of the exhibits at Saint-Pierre, the old church of an abbey which was closed in 1791, is almost the same as that described in an 1872 catalogue. 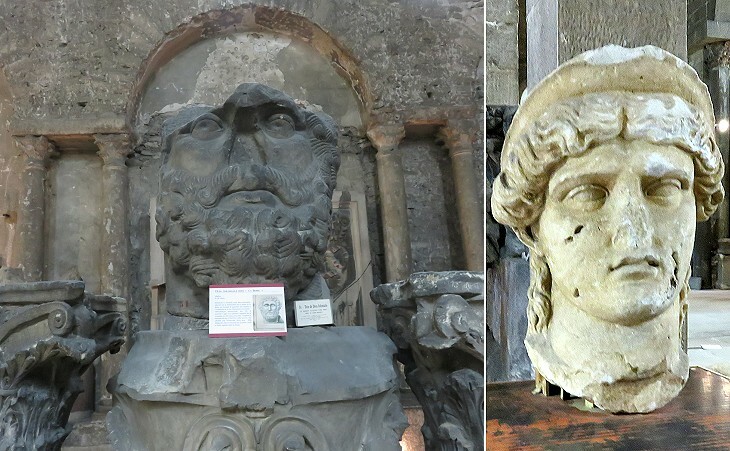 Some worn out ancient statues were nicknamed by the people of Rome in funny ways e.g. Il Babuino (Baboon), actually a reclining Silenus. 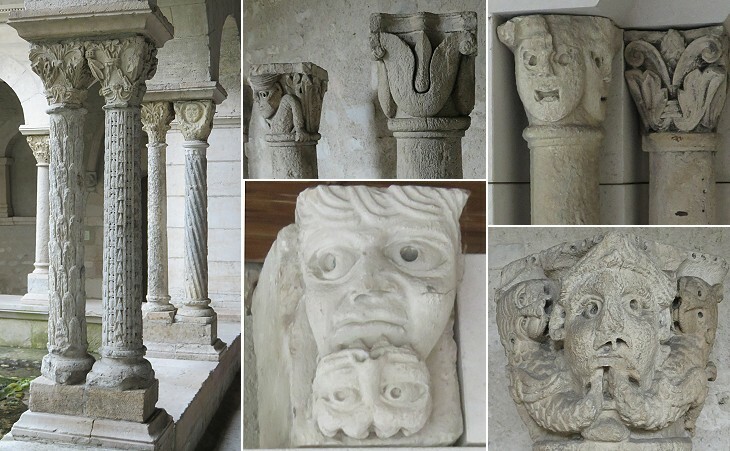 The head of a colossal statue ended up on one of the gates of medieval Vienne and it became known as La Bobe, a local way to say moue/pout/pull a face. Chorier assumed it portrayed Jupiter; in the XIXth century it was suggested it was instead a portrait of Hercules, but today the curators of the museum believe it is the head of an emperor, perhaps Septimius Severus. 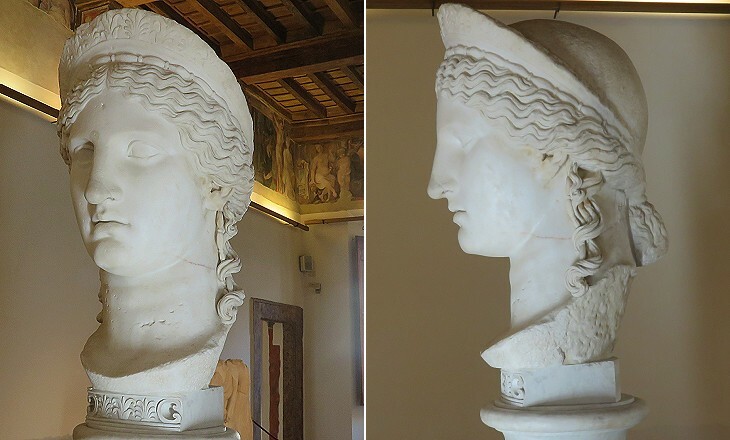 Another head of a colossal statue was found in the area of the theatre and it is usually considered a portrait of Juno (see the statue of Giunone Barberini in Rome); however in 2000 Emmanuelle Rosso suggested it could depict Antonia Minor, niece of Augustus and mother of Claudius, whom many archaeologists believe was portrayed in Hera Ludovisi, another head thought to represent Juno (it opens in another window). Tyche was the tutelary deity of cities and she was portrayed with a tower (see a statue from Italica) or town walls (see a mosaic at Scythopolis) on her head and with a cornucopia, a symbol of wealth; the Romans called her Fortuna (Luck). The statue was found in 1894 in the ruin of Palais du Miroir, a Roman bath establishment at Sainte-Colombe on the other bank of the River Rhône near Saint-Roman-en-Gal. The very many exhibits of the museum are arranged in a rather haphazard way which requires the visitor to use his own judgement or instinct in selecting the most interesting ones (which is not necessarily a bad thing). 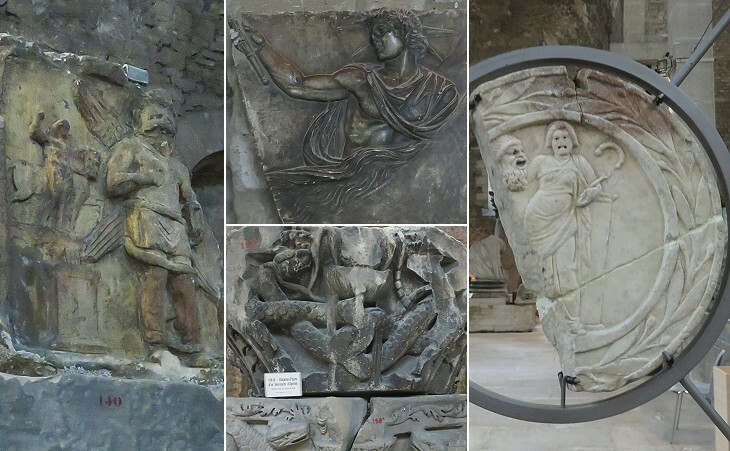 The choice of images shown above is about the many aspects of religion in Roman Vienne: traditional in the worship of Apollo, esoteric in the depiction of Leontocephalus or superstitious in the hanging of "oscilla", as these objects might have had the purpose of chasing evil spirits. The museum was meant to house architectural fragments, statues and inscriptions and it has only a limited number of floor mosaics. 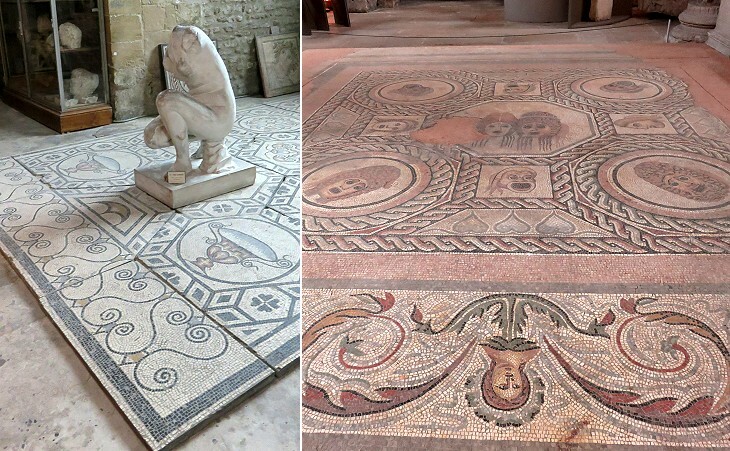 Some fine mosaics were moved to the Museum of Lyon in the XIXth century and others are displayed at the new museum of Saint-Romain-en-Gal. 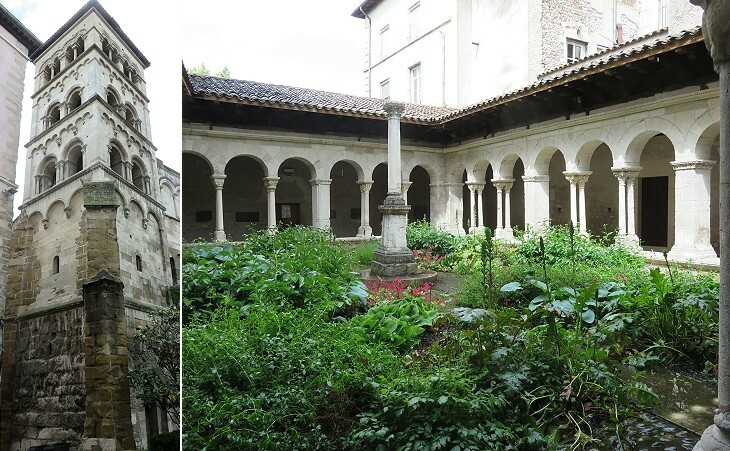 In the XIXth century the practice of using former churches or convents as sites for storing ancient materials was common in many towns of France, e.g. at Lyon, Avignon and Narbonne, as well as in Spain and in Italy. These museums are doomed to be closed; this could result in a small number of exhibits being displayed in large halls, maybe with stunning light effects as at Burdur, while the great majority of them would disappear from public view. The Monastery of Saint-André-le-Bas was founded in the VIIth century on the site of previous Roman buildings: it was closed in 1791; its cloister was built in the XIIth century and its architecture and decoration testify to the mix of Roman patterns and medieval symbols which characterizes Romanesque art.